VIZ is a modular platform that enables transit operators and users to access real-time and historic information. VIZ allows operators to monitor system performance and allows riders to access real-time information. What is a VIZ module? A module is a static website, built on the VTFS API, which provides a window into some aspect of a transit agency's operations. Generate a flexible report on historical data, visualize the current state of the system... the possibilities are as broad as the API. Agencies can upload modules into your custom VIZ instance to have reporting at your fingertips. If you've developed a VIZ module and want it included here to share with transit agencies and developers, please contact us. You are welcome to submit both agency-specific and general modules. Keep in mind that the latter is more likely to be useful to multiple agencies. Simple module that illustrates how to use the VTFS API. It displays the agency's information contained in its GTFS files. Vehicle locations (actual and scheduled) in real time. The position of the buses can be overlaid on a map or on a linear view. Delays can be quickly visualized via pulsating discs on the vehicles. A tooltip provides additional information for each vehicle. Tool to analyze real arrival information. 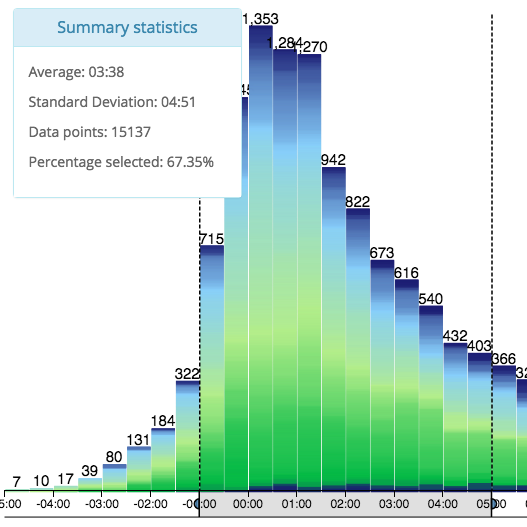 Delays and headways histograms can be dynamically generated. The user can select specific routes, stops, date, and times. If the data is available, it is also possible to select specific vehicles or drivers. This tool presents the vehicle trajectories in a route for a certain date. The user can see the vehicles' motion in a time-space diagram as well as an on-time performance summary and a schematic diagram of the different service patterns.